Now you can have a flash drive on your key chain that also brings light. This USB flash drive offers 8GB of storage and a flashlight. The flashlight will recharge so you never have to run out of light again. And this thumb drive comes with a key chain loop so that you can always have it with your where ever you go. The 3 inch long flash drive weighs 20 grams and the flashlight can be work up to 5 hours on a single charge witch is perfect for most situations. Now looking in a computer will be easy as you have light and looking for the lock in the door at night is easy to because the flashlight hangs next to your keys. Come and check out this USB Flash Drive With Build In Flashlight. Hurricane Sandy didn’t hit the area where I live but it made me realize that I am not really prepared for emergencies like that. Days without power will be hard for most of us and that is why this time we show you a device that can help you. This is an flashlight, USB phone charger and a radio in one. And it will bring it’s own power. First of all the handle has a build in solar panel that charges the build in battery by just placing it in direct sunlight. If the sun does not bring you enough power then you are in luck as you can use the build in Crank to get the power flowing. Now you don’t have to worry about power for your phone and you have light to with the build in LED flashlight. It even has a AM/FM/Weatherband Radio that receives all 7 channels of the NOAA Weather Band Radio Alert System which automatically alerts you when a weather emergency is in your area. 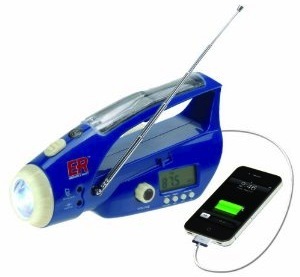 So be prepared for next time and order your ER Radio And USB Charger And Flashlight with Solar And Crank Power. Carrying around your own personal flashlight when ever you need it, that is what you want. This eGear Jolt flashlight is small and perfect for on a keychain and will give up to 2 hours of light. And the good thing is this flashlight does not need batteries as you can just charge it through any normal USB port. Just plug it in and you can use the flashlight in minutes. Beside being on all the time this flashlight also offers a blink mode. 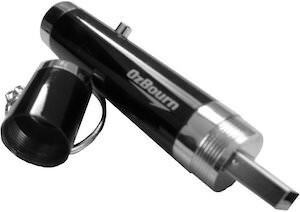 And not only does this USB flashlight come in black it is also available in light blue, green and red. 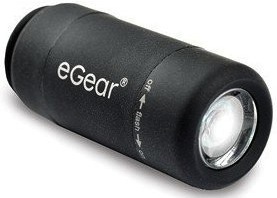 So now is the time to get ready for the dark with this eGear Jolt USB Mini Flashlight. Flashlights are never there when you need them. 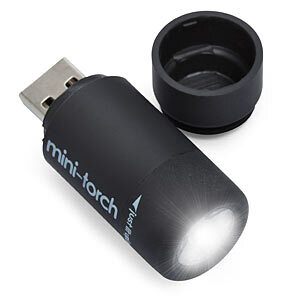 But now there is a mini flashlight that can live in the USB port of your computer or just in your laptop bag. This little flashlight charges through USB and give a ton of light. The light comes through LED’s and that means that it will give a lot of light on a little charge. For people who work in PC’s this light is handy to as it can just live in your pocket and be ready when you need it. Now is the time to come see this USB Mini Flashlight. We all know how difficult it can be to get light where you want it when you need it. 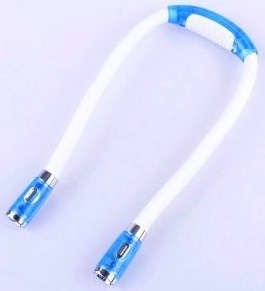 This neck light has flexible arms that you can bend in the direction you need and you can hang the light over your shoulder so now you can see what your doing while having your hands in a computer. Or maybe you are fixing the bathroom sink, or reading a book. It’s simple this little cheap light is probably the most flexible flashlight you ever had. Come have a closer look at this Neck Light. This yellow M&M will help you with some light while you are working. An M&M desk light with 5 LED’s will be a great addition to your desk. The light looks like an M&M holding a flashlight. And of course it is powered by the USB port of your computer so no extra power sockets are needed. 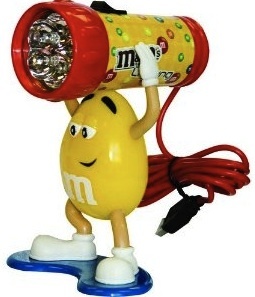 Go have a better look at this M&M USB Desk Lamp. Now we found the perfect gift for anyone you know. The GorilaTorch LED light is something on my wish list. With this light you can really have a abundance of light where ever you need it. The GorilaTorch give 65 lumens of bright LED light for between 20 hours and 80 hours (depending on the amount of light you need ) on one set of 3 included AA batteries. This torch is water resistant and with the flexible legs that would make it ideal to hang it on a tree on your campsite. And the magnetic feet make it great to help you when you are having engine problems. And can you even imagine how a real geek can use this under a desk or in a computer when doing all the tech stuff? It is hard not to scream it out loud how great this product is. So I think it is clear go and buy yourself a GorilaTorch LED light right now!